Put some white flour into the bottom of the banneton and then shake it all around so it coats the sides. Be generous with the flour! Now comes the tricky part; this is a beastly huge bread. It took about an hour in my oven at 450 and I was happy with the result (crumb pictured below, crust above). When you make a large loaf you risk doughiness in the center; let the crust get deep, deep brown. Frankly, mine could have gone even longer. It’s tough to overbake large loaves made from high-moisture dough. But the result was worth the effort. If I can find a small banneton, I’ll post again. Has anyone tried to bake (or just proof) in a stoneware form to maintain the integrity of the design? I work with clay and it would allow my creativity including the coil effect. As long as you flour the inside so the dough doesn’t stick to the form I bet it would work. If you do make one please report back so we know how it turned out! I have a terracotta brotform, I dont see why ceramic would not work just as well. Yes, I think it should work in the same way, just make sure to flour it well, because of our sticky dough. 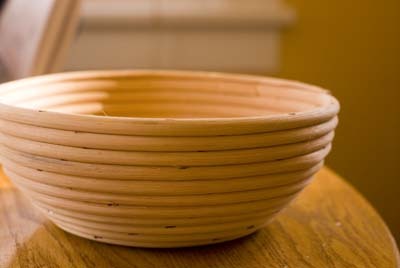 Hi there I don’t know if already posted, but another cheap brotform alternative is a waffle weave tea towel in a appropriately sized bowl. Generously flour the tea towel and give a spritz with a bit of cooking spray. Don’t have to worry about longevity of a traditional brotform staples if you want to do overnight rises in the fridge with very wet dough etc… The larger the waffle on your towel the more dramatic the look. I even managed a slight flower decoration on one loaf using an embroidered cloth napkin, before I found the waffle tea towel. That was pretty cool! Kelly: Thanks for the great tip! I should add I use this technique so I can make a grapefruit sized boule – instead of an enormous loaf which you get with a brotform – I use my smallest glass mixing bowl. The bigger the loaf the more side folds the teatowel needs, and it is just not as pretty. I also cover with parchment. Just before baking I flip the whole thing onto the peel, remove the towel, slash and into the oven pronto. They say they’re for a half-pound loaf, but that doesn’t make sense given that you needed 3-4 lbs of dough for the 8 inch size. I’ve ordered a couple of these smaller ones and am going to give them a try. Judith: Yes, sometimes the marked size/weights don’t make sense to me either. I have a question. 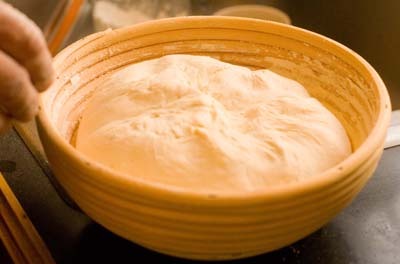 Why are people asking about how long the dough can be stored? I never seem to keep my stored more than a couple of days because we eat it too fast. Thanks for the book and its secrets! Real question: How do you keep baked breads fresh longer? I never seem to get more than 2 days out of a cut loaf. I bake a lot of sour dough breads. First, making the started I have to remove a cup a day. Instead of throwing away I freeze or use that every day for dough. The other remark, regarding freshness. 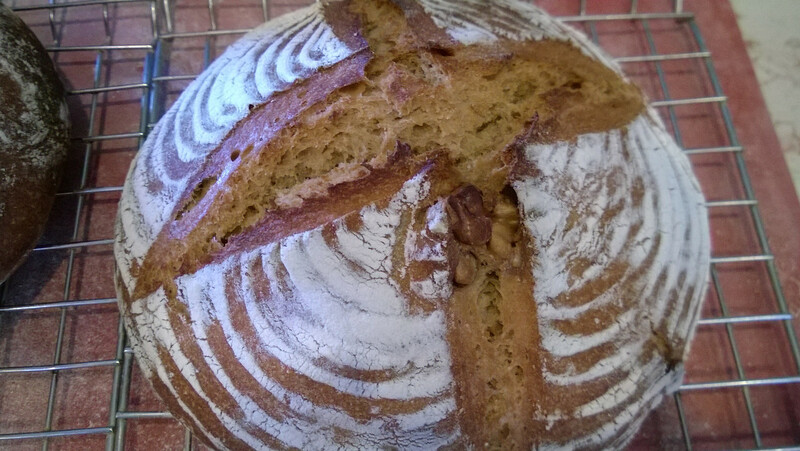 Sourdough bread lasts longer. I don’t remember the scientific reason why; but it stays fresh longer. I have frozen loaves and I have liked the results when thawed, and refrigerated. I usually leave a loaf out and it can last 5 days with no issues. 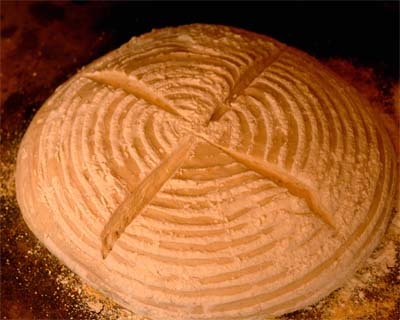 Fresh longer because of acids in the bread that derive from sourdough. The real scary question: How many calories are in a loaf? On a more on-topic note, I’ll be trying my first loaf of bread from the article on the Mother Earth magazine website tomorrow. I have the book on hold at the local library, but I’m 7th in line before I get it. I should probably just buy it now, since I’m sure I’ll end up with it anyway!! I used to bake bread using a poolish and it involved doing the final rise in a basket. However, any bowl-shaped object will do (have used baskets, bowls, colanders). The trick is to line the container first with a well floured piece of cotton (something with a fine weave). The floured cloth keeps the bread from sticking to the basket, but allows the dough to form and take on any bumps or ridges as it rises. The result is beautiful, and a more rounded shape. I’m hoping to try this with my next batch of dough. When you are working with our dough you will want to use a considerable amount of flour on the cloth, since our method requires a wet dough. Here are instrux make your own banneton. 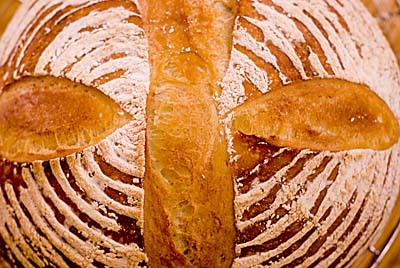 CAN I use a Bakers couche to proof baguette shape loaves.? Our stuff might stick to it, but probably OK if you flour it very well. in Germany these forms are actually known as “Gärkörbchen”. Those are available cheaply in any size you wish. I’ve been proofing the Master Boule Dough (New Bread in 5) in a 13″ long coiled wicker brotform, about 2 to 2 1/2 pounds of dough, with good results. I’ve been forming the ball and then stretching it into a log, but it takes quite a bit of handling to get it that long. Even so, the bread has a lovely, holey crumb although one end of the loaf is often a little thicker than the other because the dough is so nicely springy. In order to get a more uniformly-shaped loaf, however, I wondered if I would be better off rolling out the dough into an 11- or 12-inch wide oval and then using the letter-fold to shape it before transferring it to the brotform. I know it will stretch a bit as I am moving it to the brotform. I don’t really want to roll out the bubbles but hope that they might re-form during the steamy oven spring. What are your thoughts? Yes, I’d recommend that you use the letter-fold technique to get it to the shape and length you desire. It will rise and bake beautifully! Thanks, Zoë! I’ll do that ASAP. For some odd reason I am out of dough….again. They also have some square accessory boxes that might work for small boules. If proofing multiple loaves under one roof, they also carry larger under-bed boxes, although I find the single-loaf boxes more convenient. I just turn them upside-down over the rising dough on the counter, whether it was in brotforms or shaped as free-formed boules on parchment. This keeps them in a moist environment during the proof and keeps them from forming a skin. Since they are clear, it is easy to check on the dough’s progress. And if placing the brotforms in a right-side up box, they can be moved or stacked to save space. And lastly, the boxes are great for storing the brotforms and my bread-making equipment! In the unlikely event that you should have a spare empty dough bucket, you could use that as a proofing box for boules as well. I am fairly new to the world of sourdough breads 8 months now, but I am in love. I had recently purchased two brotforms but was not 100% sure how to use them. Your article was all I needed to give it a try. 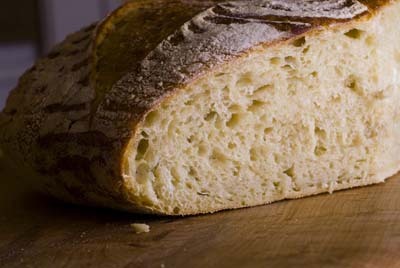 http://levitz.smugmug.com/Food/Artisan-Sourdough-Breads/i-qLR2pK4/0/X2/WP_20140314_14_31_26_Pro-X2.jpg. Can you turn it on to parchment paper first so you can score it before it goes in the oven? I actually score it right after I turn it over onto the baking stone (be careful). Or you’re way’s great too. Thank you SO much for the quick reply. I did it your way- first one not too bad and I let it go longer so it got nice and dark! I just love baking bread thanks to you and Zoe and I LOVE the new book! First off, I’m amazed that you are so great at responding to people here, and your first book changed my life 🙂 Now to my questions, is there a reason that the dough has to totally fill the banneton? Is it so that there’s less of a chance of it deflating when you tip it out, or just for the design aspect? And second, even with lots of flour my dough stuck to the wicker. I see that some people use a bit of oil before the flour. Are you opposed to that? TIA. 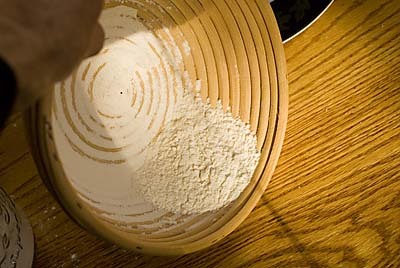 The design made by the flour is more noticable if the dough fits in the basket. If it is just a small ball at the bottom you will only have the rings on the top of the loaf. I make sure the dough has a good covering of flour, so it isn’t as sticky when it goes into the banneton. I’ve never had a need for using oil, but it may work. I’d use it very sparingly. I have had great success following exactly what Zoe and Jeff suggest. I have an 8″ basket I found on Amazon and using 3 lbs of master dough and letting it rest two hours was just the right time for it to rise. I only use rice flour in the basket (no oil, no water etc). I baked it for an hour and it got really dark but was very moist inside. The challenge I have now and keep working on is the scoring- a good serrated bread knife seems to work best for me- The more loaves I do the more the rice flour builds up in the banneton and the better the circles. My question now is what changes, if any, do I need to make with this and other breads in a gas oven. Never made bread in one before and I’m heading to vacation home that has one. Do I put the water pan on lower rack (thought I read one place it just sits on bottom of oven w/out a rack) and pizza stone above just like w/ electric oven? Can’t wait to take the “new” book and try lots of new things- just a bit nervous using a gas oven. Thank YOU! Hope you can see the picture. This is 1.5 lbs in an 8″ brotform baked for 40 minutes. Next time I would do another 5 minutes for a crisper crust. It is beautiful! Thanks for the photo. The Master recipe makes about 4 pounds of dough, and you couldn’t use it all at one time in a form that small. You’ll want to use about 1 1/2 pounds, just a touch more than a 1/3 of the batch. Be sure to flour the form generously. I have tried this twice and both times had lots of trouble getting the loaf to release from the brat form, so it deflates and loses the beautiful ring decorations. I’m using King Arthur whole wheat flour with their bread flour as the white flour., as well as vital wheat gluten. I use the extra water (41/4 C) recommended in the book. The first time I used about 1.5 pounds (what was left after two other free form loaves)- and turned it directly on to stone in hot oven- very difficult since it didn’t release well. The bread was delicious, with holes that had shiny edges as book says- it just wasn’t that pretty (or tall). The second time I used more of the dough (about how half the full bucket) and lots of flour, both on the brat form and the loaf, Let it rest until it was close to the top of the form, nearly two hours. Then turned it on parchment paper and peel first, so I could ‘mess’ with it in a safe place, then slid into oven. It is still in the oven so I can’t describe final results, but am hoping for tips on a more complete release! I love the new book! My guess–your measuring technique is leaving you with a too-wet dough. Maybe decrease the water by 1/8 cup? OR weigh the flours. If using measuring cups, are you using the scoop-and-sweep method? Thanks for your suggestions- I have thought the dough may be a bit too wet but don’t have a perfect way to know for sure (beyond trial and error). Could a too wet dough also be what makes an unconfined loaf spread out too much? (That happened with all batches I baked without the bratfrom). I am thinking it’s maybe too wet. A bit. I am a novice sourdough maker and have just bought a Benetton with liner and used for the first time I coated the liner liberally with flour but the bread stuck to the liner. I read somewhere there is a way to clean it and protect it in future but cannot find the article can you help please? Don’t think we have a post specifically on that–which of our dough recipes are you using (which book and page number?)? I use a regular size boule for smaller loaves, just gently tip basket onto a peel, score the loaf and then slide it into the oven. Amazon.com sells bannetons ranging in size from 5.5″ to 11.5″. How much dough can I expect to use for a banneton that’s more than 9 inches? What are the rising/resting times? Amazon delivered my 9.5-inch Chefast banneton yesterday. The quality and size look great, but it’s my first time to use one…that’s why I was doing a little research on how to use it… by the way, my banneton is made of rattan… Is the one in your pictures made from the same material? Thanks for your help! Not certain they’re rattan, but it is some natural material like that. Which of our books are you using, what recipe and page number, because that effects my recommendation. For now, I have a problem making the slash properly. i do have the tool needed but how and when? Just putting the bread in the oven to bake it? if I use oil in my dough? Tony: for your dough, which of our recipes are you using (which of our books and page number)?